Wordsworth called Lakeland 'The loveliest spot that man hath ever found', and few who have seen it would disagree. The heart of the Lake District National Park has a grandeur all of its own - in its massive crags and ridges, in towering fells and deep green valleys, in its labyrinth of lakes and rivers, and the glinting waters of meres and tarns. This is probably our favorite place to vacation, the Lake District in the UK. We go here most summers to visit friends, that we met here in St. Petersburg one year when they were on vacation. We stay on Walney Island, which is just outside a small town called Barrow-in-Furness. The Lakes are about 45 minute car ride from where we stay. Although considered a tourist area, the scenery is majestic and serene. There are many lakes throughout the area, all of them except one are referred to as Tarns and Waters. It has to be one of the most beautiful areas in all of England, sheep grazing on the hillsides, and small villages dotted all through the lakes. Lot's of Bed and Breakfast farm houses to stay at and of course, lot's of pubs along the way. (most of which we have stopped at for a pint!) Phil loves English beer, so he has to get his fair share during the short two weeks that we are there! 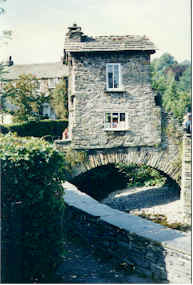 This photo above is of the Bridgehouse in the village of Ambleside. It dates back from the 17th century and is now owned by the National trust. It use to house a family of eight, which I can't imagine, it's two rooms, each no bigger than an average walk in closet! If you want to venture out a bit, Scotland is about a two hour drive from the lake district, well worth taking some time to see the town of Edinbrough. The castle is breathtaking sitting up high right in the middle of the town. One of the most famous castles in the world, whose battlements overlook the Esplanade where the floodlit Military Tattoo is staged each year, late August to early September. The castle stands on a rock which has been a fortress from time immemorial. The oldest part of the buildings which make up the castle is the 12th Century chapel dedicated to St Margaret. In addition to the great Hall built by James IV with fine timbered roof, and the Old Palace, which houses the regalia of Scotland and the military Museum, the castle also holds the Scottish National War Memorial, opened in 1927. 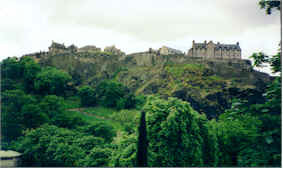 The Castle is maintained by Historic Scotland. We seem to find the people more friendly in the north of England, and the prices of food and going out generally lower than down south. The pace of life is slower and more what we enjoy, perhaps that is why we love this place so much!